Want to know who your Guardian Angel is? Now you can find out, thanks to numerology. This article (my most popular post, updated for 2019) is based on original research. As a psychic in Brisbane, clients ask me which Angel or Guide is looking over them. That’s why I’ve written this, to help you to connect with your spiritual helpers. Life’s easy when you know who to call on. I’ve focused on the Archangels, as they are the most powerful ones you can summon. Please know, the words Angel and Human both have 21/3 numerology. We are equally powerful and healing. The only difference comes from your thinking. You create the idea of Go(o)d, not the other way around. Angels have outer wings, while we have inner ones (our lungs, which help our hearts to soar). They guard the sky, while we guard the planet, hence the term ‘Earth Angel’. This is what you truly are. 2019 is a 12/3 Universal Year of Inner Child Healing, which includes releasing concepts of religion and sin to reclaim our innocence. You are here for freedom! 1) Write your date of birth in dd/mm/yyyy format. 3) Reduce this to a single number e.g. 3+5 = 8. This person has an 8 lifepath in numerology. Hint: If the sum of your date of birth is 11, 22, 33 or 44 do not reduce it. You have a Master Number lifepath. Visit Find Your Lifepath for specific guidance.4) Check the list below to find out who your Angel is. Dear Archangel (add name), thank you for protecting me all my life. I wish to form a deeper connection with you now. Please send me clear signals, starting from today to keep me on track and on purpose. I specifically need help with (list any issues you need solved). Thank you for stepping in right away. I know you with me. Let the miracles begin. Amen (optional). 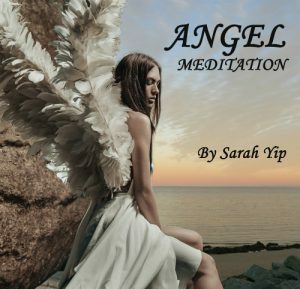 You can also connect by using my Angel Meditation– daily listening will create a stronger bond and manifestation ability. 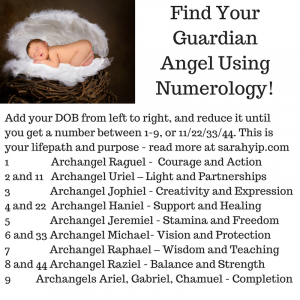 Each Angel’s name numerology vibration is in brackets. I’ve also included a keyword that corresponds to the Angel’s name number. ONE Archangel Raguel (28/10/1) – keyword HERO. If you are a 1 lifepath (The Pioneer), call on Raguel for integrity and the courage to stand up for yourself. Raguel is a fighter for justice and fairness above all. 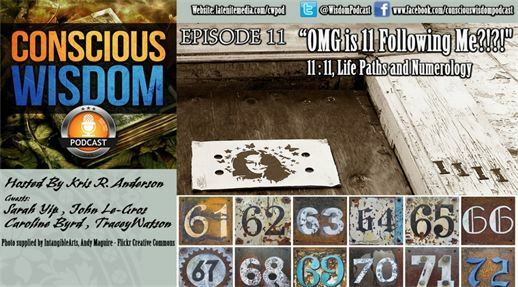 Note: If your lifepath reduces to 10, it’s a 1 lifepath! TWO and ELEVEN Archangel Uriel (29/11/2) – keyword LIGHT. If you are a 2 lifepath (The Peacemaker) or master 11 lifepath (The Spiritual Messenger), call on Uriel for wisdom and clarity, especially when all seems lost. Uriel shines light in the darkest of times, helping us to see that we are eternal beings who can never truly be harmed. FOUR and TWENTY TWO Archangel Haniel (31/4) – keywords GARDEN and FATHER. If you are a 4 lifepath (The Builder) or 22 lifepath (Master Builder), call on Haniel for constructive feedback, support and healing in work in romance. Haniel loves to reassure you of your worth and encourage people to bloom. FIVE Archangel Jeremiel (41/5) – keyword YIN YANG and PYRAMID. If you are a 5 lifepath (The Rebel), call on Jeremiel for objectivity and staying power to overcome obstacles. Jeremiel loves to show you the rainbow after the storm. He also helps spirits to pass over. SIX and THIRTY THREE Archangel Michael (33/6) – keywords TEACHER and BLESSING. If you are a 6 lifepath (The Lover) or Master 33 lifepath (Master Teacher), call on Michael for protection and the clearing of negative energies. Michael is the Chief Angel and all lifepaths can request his help 24/7. I always ask him to surround my car with blue light while I’m driving. He’s very quick to act! SEVEN Archangel Raphael (34/7) – keyword PLEASURE and MOTHER. If you are a 7 lifepath (The Seeker), call on Raphael to bring your life into balance, particularly your health. Raphael brings truth to communication and can help you to listen to/ love your body. EIGHT and FORTY FOUR Archangel Raziel (35/8) – keyword WATERFALL and CREATOR. If you are an 8 lifepath (The BOSS), call on Raziel to activate your intuitive flow. Raziel can reveal the mysteries of the Universe to you, including how to boost your clairvoyance (clear-sight), clairaudience (clear-hearing), clairsentience (clear-feeling) and claircognisance (clear-knowing). NINE Archangel Ariel (27/9) – keyword LEADER or SCHOOL. If you are a 9 lifepath, call on Ariel to show you how to make a difference in society. Ariel loves to help people to protect the planet while enjoying its beauty. I note that Archangels Gabriel (36/9) and Chamuel (27/9) also have a nine vibration. This is no surprise, as 9 is the number of completion and is a sign of great maturity. Interestingly, Jesus has an 11/2 vibration, and Buddha has a 22/4 vibration. Visually-speaking, Jesus represents people who are equals (see how the 1’s both stand tall?) and Buddha reflects peaceful partnerships (the 2’s are like swans in love). You can call on any Archangel, any time for help. I’m simply highlighting who your naturally assigned Archangel may be. In my belief system, Angels don’t have a gender, although some have masculine or feminine names in popular culture. We all have a Spirit Team that includes Angels, Guides and passed over relatives. While we have a lifelong guide who stays with us, others in the mix come and go depending on what lessons we are learning. The Archangels listed are only a starting point. It’s best to meditate to find out who your Spirit Guides are (they can change!) I get goosebumps when mine are around. Google your Guardian Angel for more information. Celebrating them with paintings, music and prayer will help you connect. I’ve allocated the Archangels using Pythagorean Numerology. In this system, each letter has a number, e.g. AJS=1, BKT=2, CLU=3, DMV=4, ENW=5, FOX=6, GPY=7, HQZ=8, IR=9. I’ve used the vibration of each Angel’s name to match it to a lifepath e.g. ARIEL = 1+9+9+5+3 = 27/9 or a 9 vibration.